Something I have been completely wrong about is the best way to use slide software in a math class. A few years ago I wrote a design series explaining how I use color theory, grid systems, etc., to clarify complex procedures, but the whole thing turns out to be simultaneously a) a lot more fun and b) a lot less time-consuming than that. I’m not trying to set up a false dichotomy here. We do both. Both are important. But all too often slides like that first one, with the classroom dialogue and solution method predetermined, cordon off classroom dialogue and student reflection onto very narrow paths. That kind of pedagogy does nothing to unify mathematics, tending, instead, to position complex procedures in isolation from each other, which is a very confusing way to learn math and a very laborious way to teach it. Instead, I want my students to focus without distraction on a) how new questions are similar to old questions, b) how tougher questions demand tougher procedural skills, asking themselves c) which of their older tools can they adapt to these tougher questions? For example, I put six equations on separate slides, equations we have seen. 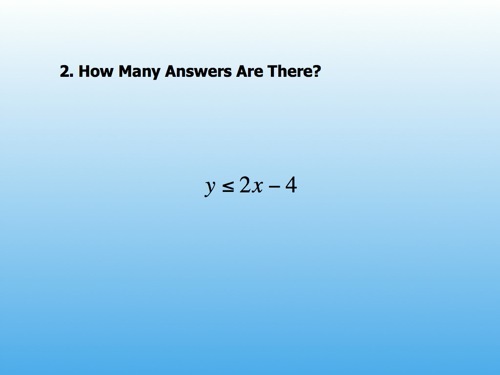 I asked, “how many answers are there?” One. Two. Zero. Etc. Then I put up an inequality, tweaking the problem slightly, and quickly. They told me there were lots of answers. I asked my students to start listing them. 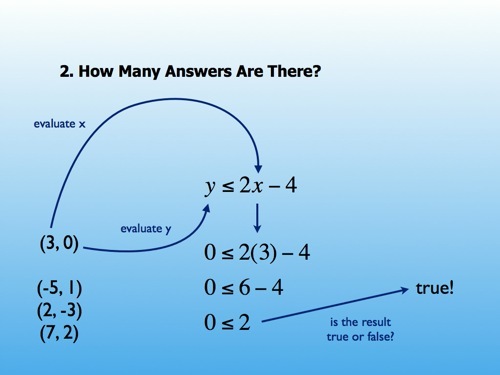 “7, 6, 5, 4.2, 4.1, 4,” etc.This became tiresome quickly and made the introduction of a graph — a picture of all those answers — clear and necessary. Slide software makes it easy to sequence these mathematical objects, ordering and re-ordering them to promote contrasts and complements. Slide software lets me sequence these mathematical objects quickly, from anywhere on the globe, from photos and videos I take, from movies my students watch, from textbooks too. Graphic design is useful to mathematics, but I am happy to have discovered certain constraints on that usefulness and, simultaneously, higher fruit hanging elsewhere. It is the curation of this mathematical media that interests me now, though I reserve the right to return to this space shortly and reverse myself again. These days the technologists who remain vital are not experts and not generalists but rather techo-existentialists. The mantra is learn what you need for NOW and let it go – chances are it will change by the time you need or use it again. Someone help me out here. How has clear, cinematic communication changed since The Jazz Singer first deployed synchronized music and dialogue in 1927? If, in fact, those conventions haven’t changed appreciably in nearly a century, shouldn’t the edublogosphere match its seemingly boundless enthusiasm for new media creation tools and new mechanisms for distributing those media with some reflection on the ancient, unchanged fundamentals of those media? Darren: My favourite bit came at the very end when the teacher turned and spoke to the camera: “That was gooood!” That comment encompassed so much; about him, his students, and how they all feel for each other. A milligram of sober deconstruction (“why do I like this?”) is worth, for my money, a kilogram of exuberant, big-picture futurism (“how does this change everything?!”). It would do this old curmudgeon’s heart some good to see some balanced restored to our discussions of ancient arts. 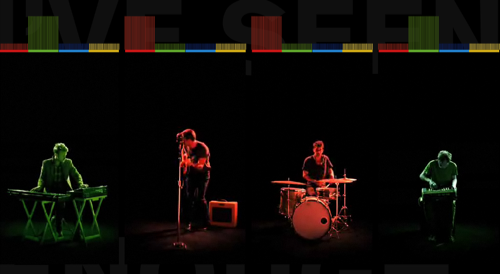 Killer concept and execution on this Cold War Kids video. You can activate/deactivate any instrument at any point in the song and change any musician to any one of four tracks. If we set all the tracks before the video starts, how many different videos could we watch?Further: the song is 3:10 long. If we started watching all of those videos right now, on what day and at what time would our marathon end? How many times did each musician have to record the song? The difference between those two numbers is staggering, worth classroom discussion, a sign of the times, etc. By Dan Meyer • May 25, 2009 • Comments Off on Cigotie, Ctd. Cigotie: I also see many kids online doing the same exact thing, as inspirations like Video CoPilot, Creative Cow, etc. And I also agree on how people are getting too sucked into a world, full of copying and project file manipulation, that they have lost all creativity themselves. Find an area that you’re interested in, blog on it, daily, and then keep doing it for ten years, even when it seems out of fashion, even when it seems like your influence is waning and other people’s stars are rising. Reflect your reading, your learning, your developing understanding of the field. Stay true to your own values, and don’t relent when it looks like you’ve peaked. If I go a week without blogging, that wobbly, nagging feeling I get owes less to an obligation I have to an audience and more to the fact that this is the place where I learn and an outlet for my excitement. If I don’t blog for a week, then either a) I haven’t learned enough, b) I haven’t been excited by enough, or c) I haven’t carved out enough time to keep that learning and excitement cycling through my brain. Blogging, in any of those cases, is a nice way to step on the intellectual scale and take a reading.